I've been arguing this point for years now! He had PP/KG, both of whom in their mid-30s, playing all of the time, to maintain leads and give the Celts a chance of winning during those contender years, from '08 to '12. And now finally, after all those years of me hollering at you, you see a Brad Stevens, learning how to utilize, EVERY MAN ON THE ROSTER, to maintain leads and perhaps, even win some games even while his equivalent of KG/PP were on the bench, nursing their wounds. This is why I will never respect Rivers. Sure, if KG/PP were 24-28 years old and at 100%, game after game, they wouldn't need a team. They could hire a bunch of scrubs and go, 60-22, season after season. In effect, this is what Doc's strategy had hope for, in terms of being a regular championship contender. Stevens, on the other hand, never had that luxury. He had to think and then, out think the opponents, game after game. In effect, if he had KG/PP, he may have been even used both of them as elderly co-sixth men, and won series. I think with CBS, we win 3 titles with that team. Yes, injuries played a part and they sucked (especially 2009), but I feel CBS could have still maximized their chances with whoever else they had. Doc couldn't, and he hasn't been able to with the Clippers at all either. Doc is and was only as good as his players. Unless Stevens could have convinced KG to have the bone spurs removed from his knee prior to the 2009 season, and thus KG not further damaging the knee by playing on it, there's nothing he could have done. X's and O's had nothing to do with why those teams didn't win another title. Age and injuries held that group back. I don't think so. The injury to KG cost one title and the injury to Perk cost another. The only thing that could have made a difference was the Shaq and Jermaine O'Neal signings, which set up the Jeff Green trade, and that wasn't all Doc even if he pushed for it. Would Brad have ok'd the Melo and Sulenge picks or the JJJ and More picks? Maybe not and maybe that makes a difference. I think Brad is great but I also think Doc is a really good coach too. The Situation CBS came into was perfect... I think it would have been a totally different situation for him if he had inherited those old heads..
Actually, it was that very issue that happened to be the biggest reason as to why they lost in 2010 and beyond, imo. Even during the semifinals against the Cavs in 2008 the "coaching" was atrocious, in my view. I mean, how can anyone not find a way in which to exploit the defensive stalwart that was Wally Szczerbiak? Ugh. The bottom line is no amount of coaching could have made up for the injuries to key players that team sustained. It's just an absurd concept that has no merit. I actually find the idea rather humorous. After winning the title , Doc Rivers did the biggest favor he could have ever given Boston . Thank you Glen Rivers for that ! Your my hero for leaving . Don't see that Stevens would have gotten anything more out of that team than Doc. Doc did a masterful job getting that group of players that never played with each other, to go from a 24 win team to a 66 win team that had one of the best defenses of the last 25 years and win a title first year together. Never been done before. Hasn't been done since. Doc got screwed out of the COY that year. In 2009, Doc had that team winning at a more impresdive rate than the championship year. The defense was arguably better than the previous year. Then KG went down and that team went about as far as they could. In 2010, the team went to the Finals and got screwed by the refs. Maybe another coach would have gotten more regular season wins out of the group but they got to game 7 and the refs handed the game to the Lakers in the 4th. Would some other coach have been able to get the refs not to make those calls? No way. By 2011 and 2012, age took over and the window was closed. I am not convinced that another coach could have gotten more than one championship in that 3 year window and maybe not even one. Stevens is an amazing coach but I don't think he would have done anything more than what Doc did. For that veteran team Doc was an incredible, perfect fit and did everything he could, including bringing a championship to Boston. If Doc was the coach with this current squad however, I don't think we move pass the first round. 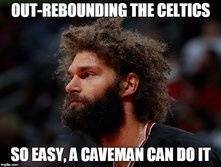 Stevens is the perfect fir for our current team. Doc could be frustrating at times but I wouldn't have replaced him with anyone else at the time. TP. Took the words right out of my mouth. I agree that Brad is a better coach than Doc, but Doc was the perfect coach for the Big 3 era. As others have said, coaching was not the issue in the Big 3 era. Injuries were. Doc had a reputation for being a player's coach, which helped the players respect him in the locker room. I don't think Brad could have done the same. Dare I say that because of CBS, Doc Rivers' coaching has gotten a little underrated around here?